It felt like a particularly bad dream – you are racing, swimming hard through warm clear blue water (good dream this) the next buoy seems quite far away, eventually you reach it and try to swim round it – this takes so long you think the buoy is moving after you……then you look harder – it IS moving – there is a frogman on the other side of the thing pushing it! 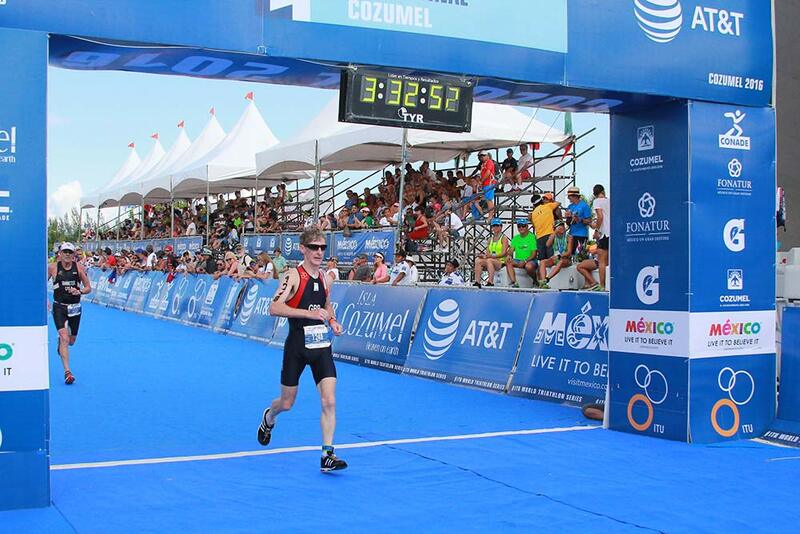 This is so silly you realise it’s not a dream, and remember its Cozumel 2016. The Caribbean has strong currents just off the Mexican coast and the markers were dragging their anchors, so time to focus on the task in hand and swim better. It had all started at sunny Gatwick a few days before, leaves just changing colour, sunny and cool. A 10 hour flight on Virgin Atlantic had taken quite a few members of Team GB out to Cancun, and organised by the orange shirts of Nirvana Europe, we’d got on the right ferry for the 45min trip to the Island of Cozumel. Even arriving at 9pm local time (=horrible o’clock body time – Cancun is about 5hours behind the UK) could not hide the big difference in climate – the humidity. At 80-90% humidity it feels like being wrapped in a permanent hot wet blanket. For swimming (sea @29C – nice!) and biking (as long as you keep the speed up), this sort of weather is just the ticket, but running at any time of the day or night was tough – after 400m you felt completely overheated – especially as a pasty wee Scot! We DO NOT do humidity. So the next three days were spent resisting the temptation to turn up the aircon REALLY high, and instead trying to relax in that hot blanket feeling. 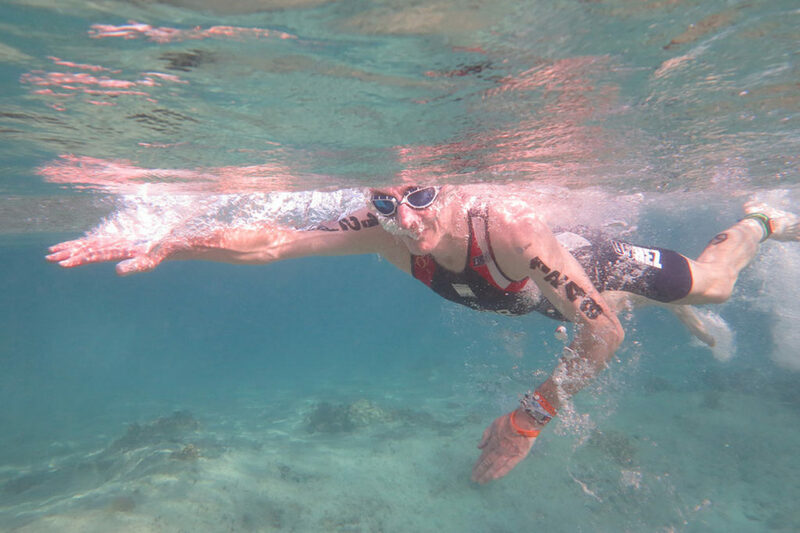 Also getting used to a sea swim with no wetsuit (at 29C, not a problem, the sea helping counteract no wetsuit flotation), and biking parts of the bike route – nice smooth road next to the sea, and we managed to dodge the tortoise or turtle crossing the road……but running was not nice. This was in spite of lots of running all summer in three layers more than necessary, and a bit more time in the shower – but not running. Apart from this, everything was looking good for the event. 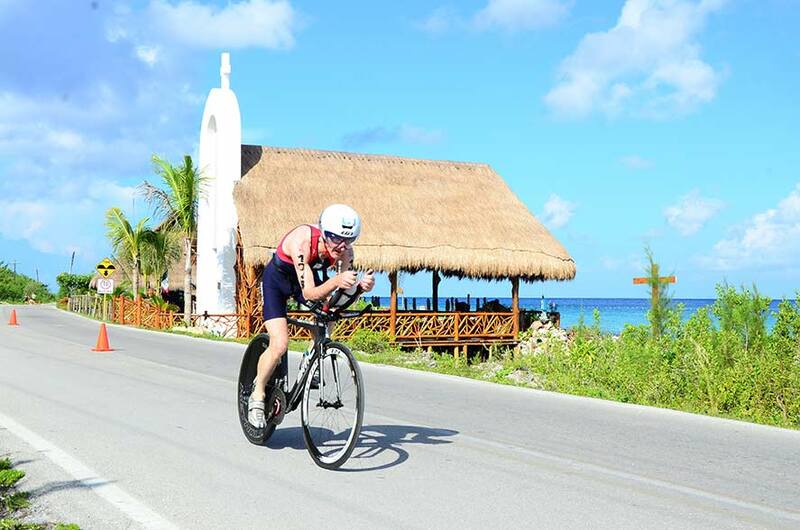 The resort organises an full Ironman and a 70.3, so plenty of experience on tap and the race layout and transition showed this with wide open spaces and lots of room for all the usual kit. However, with their usual humour, the organisers had added one surprise. The path from the swim to T1 crossed the run course about 200m before the line, so they’d decided a bridge was just the thing. 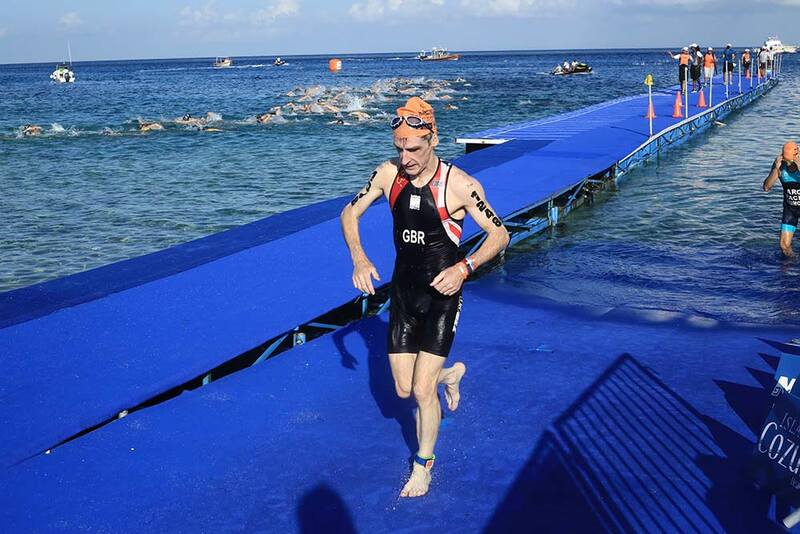 A BRIDGE – so first you swim 1500m with moving markers, then run at least 600m towards T1 – it was quite a way from the beach to the bikes – then you have to climb 20 steps up, and run down a ramp to get to the bike racks. How the organisers must have smiled as we staggered over the bridge. After that, the bike was quite straight forward – AG athletes had a long (20km) out and back course, not the short laps you may have seen the elites do. Very scenic the bike, quite close to the sea and no sign of that tortoise. 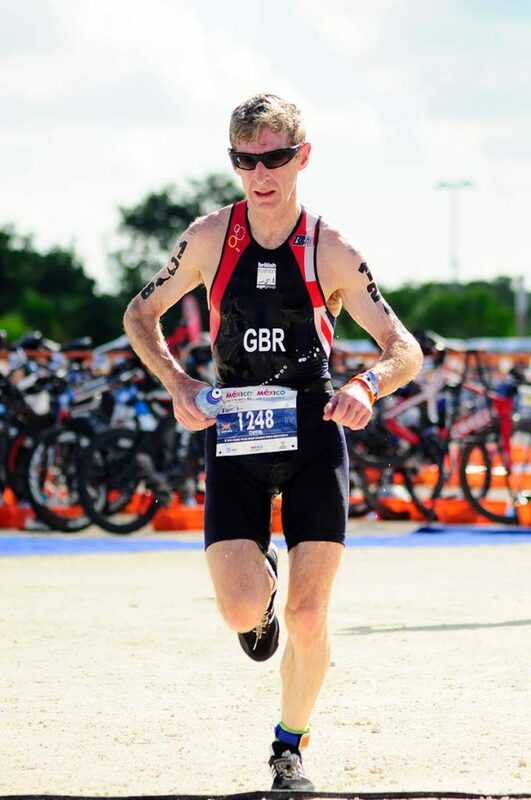 My race plan was to push hard all the way as a very flat bike course is normally not for me, and my fellow Team GB rival is a much bigger and better biker – about 3:40 faster than me in Lisbon – so slightly wobbly legs set off for the run about 70 mins after that bridge. The wobbly legs did not wear off, and in spite of good support from the marshals and aid stations – it’s interesting how much ice you can get down the front of your trisuit as long as it does not slip too far down…..I don’t feel my run was that great. As normal with four laps you pass other old geezers in lycra stumbling along but have no real idea of where your rivals are. It turned out that many were in front, Team USA having set some fantastic swim times and I never troubled them, but as I turned THAT corner (later famous for showing the world a wobbly Jonny Brownlee) I was overtaken by a vaguely recognisable figure – George van Meter of the USA who’d nearly caught me in Chicago the previous year. 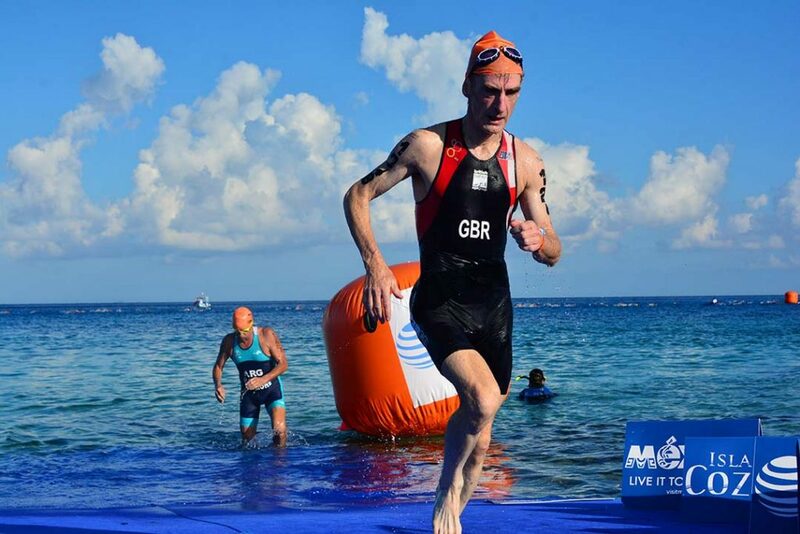 This was not going to happen, so it was time to dig in and hold back any effort until nearly on the line – it was a long way from the corner to the finish. The last 50m was quite a long way, but I managed to struggle past and prevent Team USA filling the first six places – but even 4th place was 2mins away – so it was a bit of a private battle. Overall a great experience, energy, enthusiasm and organisation from the local team, and for the first time underwater shots of the swim (more frogmen….). Work is already underway to mend those swim legs James, but I’ll need a motorboat to catch the leading Americans in Rotterdam.